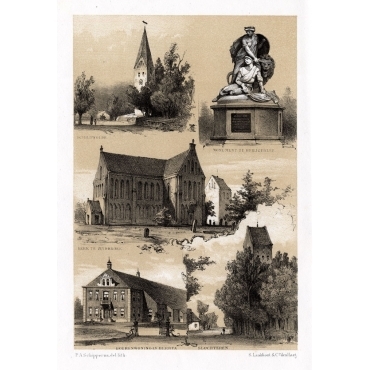 Antique prints of Europe. Original, old prints of Europe. 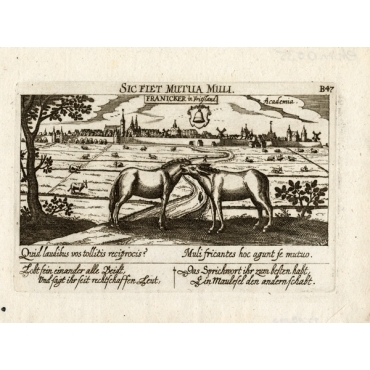 Bartele Gallery offers many antique prints of Europe. 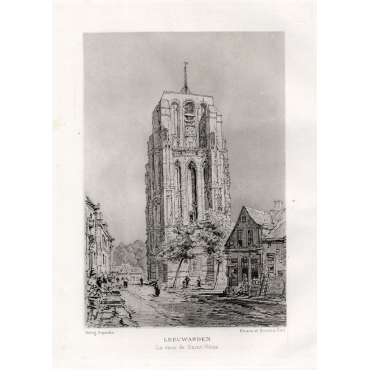 With two physical stores in the Netherlands, our collection antique prints of Europe also includes many old prints of the Netherlands. 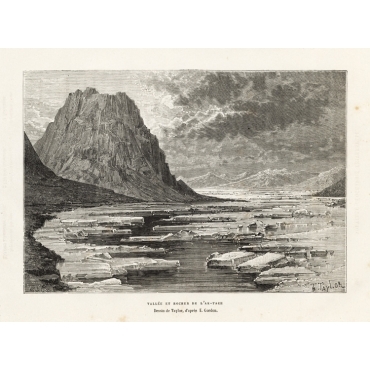 Explore our collection antique prints of Europe from the 16th to the 20th centuries. Antieke prenten van Europe. Originele, oude van Europe. Bij Bartele Gallery vindt u vele antieke prenten van Europe. Bartele Gallery heeft twee fysieke winkels in Nederland, onze collectie antieke prenten van Europa bestaat dan ook voor een groot deel uit oude prenten van Nederland. Ontdek onze collectie antieke prenten van Europa uit de 16e tot de 20e eeuw. 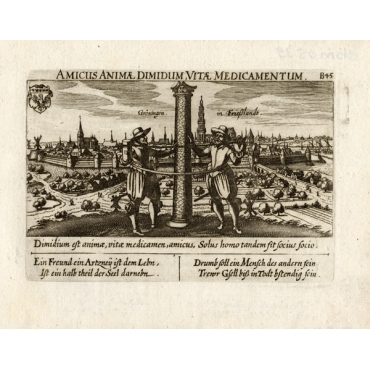 Antique Prints | Europe There are 356 products. Plate : 'Defile du Darial.' (View of the Darial Gorge. Georgia and Russia). Antique Print titled 'Swerte Sluys - Ommer Schans', Zwartsluis and Ommerschans near Meppel and Genemuiden in the province of Overijssel, with boats on the Vecht river, The Netherlands, Holland. 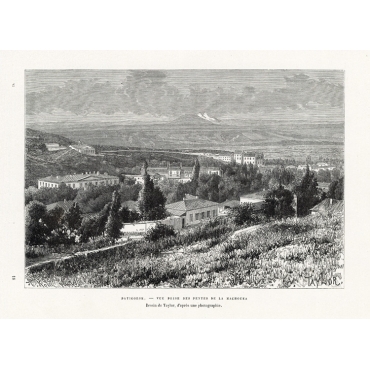 Plate : 'Patigorsk - Vue prise des pentes de la Machouka.' (View of Pyatigorsk. Russia). De Gelder - Scherpenzeel - Rande. (Ranch, property De Gelder in Wijhe, Olst-Wijhe - View on Scherpenzeel - Rande, Castle Oud Rande in Deventer.) These views are in the province of Overijssel and Gelderland, The Netherlands. 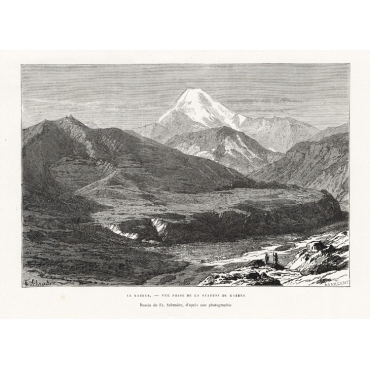 Plate : 'Vallee et Rocher de L'Ak-Tach.' (Valley and Rock of the Aktach River in Dagestan Russia). Schildwolde - Monument te Heiligerlee - Kerk te Zuidbroek - Boerenwoningen Beerta - Slochteren. These views are in the province of Groningen, The Netherlands. City: 'Franicker in Friesland, Academia' (Franeker is a University city in the province of Friesland, the Netherlands. ); Theme: 'Sic fiet mutua muli.' (The original and the copy differ little from each other, as lies are concealed with lies, as two mules scratch each other.) Edition: 1678. 'De Brink te Assen - Hunebed bij Rolde - Eext - Grafkelder bij Eext.' (The Brink in Assen - Hunebed near Rolde, D18 in Aa en Hunde - View on Eext with farms in Aa and Hunze, near Gieten on the Rolderrug - Crypt near Eext.) These views are in the province of Drenthe, The Netherlands. 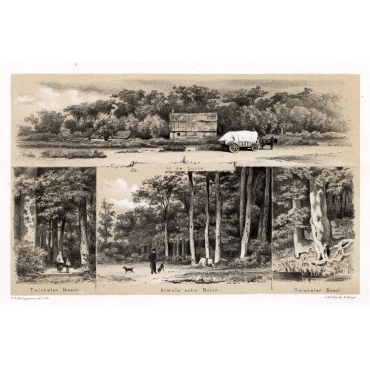 Plate: 'Wijarda-State.' (Wijarda Castle.) This Castle was situated in the province of Friesland in Goutum. The castle was first mentioned in the 14th century. Well known occupants were the Wiarda family. It was demolished in 1882. 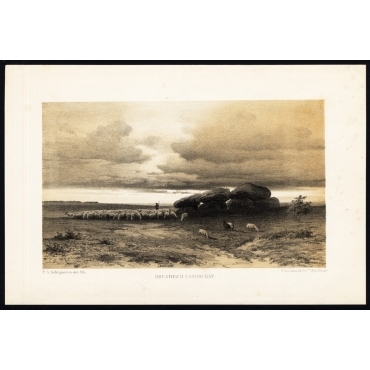 'Drentsch landschap.' (Drents landschap met hunebed. Landscape, view in Drenthe, with dolmen, a shepherd with sheep.) These views are in the province of Drenthe, The Netherlands. Plate: 'Orxma-State.' (Orxma Castle.) 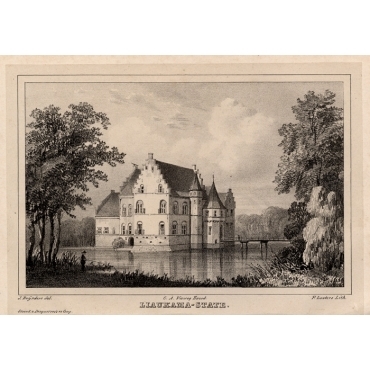 This Castle was situated in the province of Friesland in Menaldum. 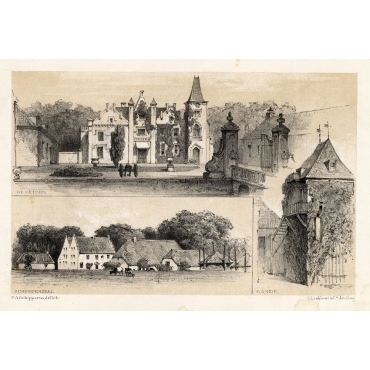 The castle was demolished in 1831. 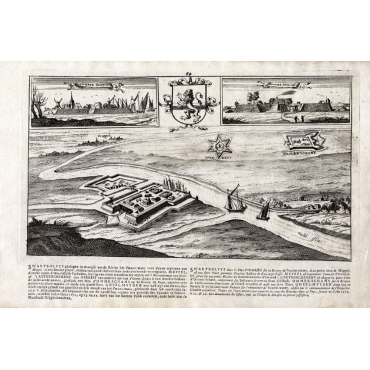 Well known occupants were the Van Juckema family and the Van Camstra family. 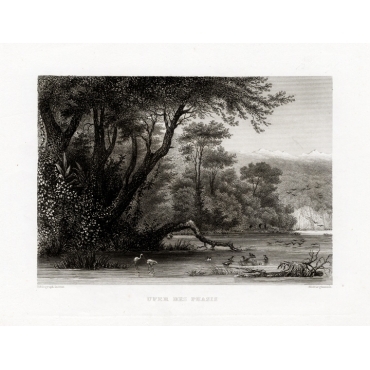 Plate : 'Ufer des Phasis.' (The bank of the Rion river, Russia). 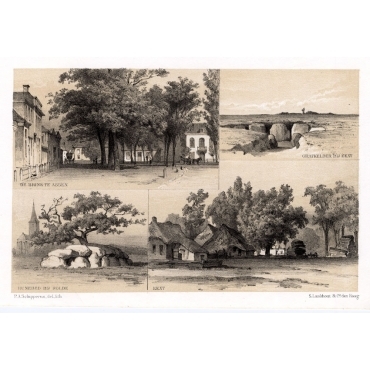 Markt te Hengelo - 't Gewezen huis te Hengelo - Oude Poort van 't gewezen huis te Hengelo - Landschap in Driene.' 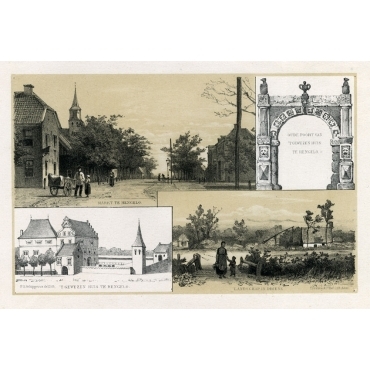 (Market in Hengelo - Orphanage in Hengelo - Old Gate of the orphanage in Hengelo - Landscape in Driene.) These views are in the province of Overijssel, The Netherlands. Plate: 'Liaukama-State.' (Liauckama Castle.) This Castle was situated in the province of Friesland in Sexbierum. 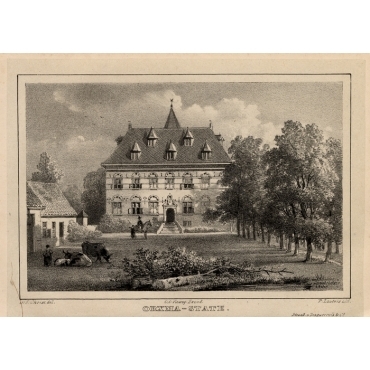 The castle was demolished in 1824. Today there is a hotel and restaurant on the castle grounds. Plate : 'Das Thal von Goksu.' (Goksu valley, Turkey). 'In de Lutte - Twickler Bosch - Almelo'sche Bosch.' (In the Lutte, is a village near Losser - Twickler Bosch, Twickler bos, Twickel is a castle near Delden with famous gardens and parc - Wood in Almelo, bos in Almelo in Twente.) These views are in the province of Overijssel, The Netherlands. Plate : 'Kay und Caravanserai in Scutari.' (An inn in Scutari / Uskudar, Turkey). City: 'Groningen in Friesslandt.' (Groningen is a city in the province of Groningen, the Netherlands. ); Theme: 'Amicus animae dimidum, vitae medicamentum.' (Friendship is the best medication, as 2 friends stand strong next to a column held by their ties.) Edition: 1678.